A precious botanical perfume oil composed of rare costly essences of Moroccan rose absolute, Sandalwood oil, Aloeswood (agarwood), Frankincense (premium select), and Wild Myrrh from Somalia. This exotic blend will put you in a a serene meditative mood. 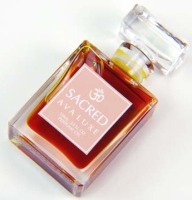 The perfect perfume for meditation, yoga, and all body energy work. This sounds like it's right up my alley, I love the resin fragrances, especially myrrh and frankincense. Love how simple the bottle is too. It does sound really lovely! If you want it though, buy it now — looks like there are only 2 bottles left. Just peeked again — says 2 in stock! it's under the pure parfum and it's the photo of the gold mask. It doesn't say Sacred on it – it says “limited edition', I think. The thing about Serena's fragrances is (it seems to me) that she may have only a few bottles in stock at any given time, but she does continue to make product and replenish her inventory, and if she is out of something, she'll take orders even if they're not available for immediate shipment. It's truly made-to-order perfume, in a way. I recommend trying out her products, but it looks like maybe it's harder or impossible to get samples nowadays — try sending her a message via the Etsy site if interested. I think that's right — things come & go over at her Etsy store. Reminds me of the smokey incense used at a church ceremonies. Overwhelming and migraine inducing scent. Smelled medicinal and unpleasant. It took a lot of scrubbing to get rid of. Wasted 45$ on this one, very disappointed. So much for the “serene meditative mood” description. So sorry to hear that! I have not tried it.